This day was established at the initiative of environmentalists and people concerned about the decreasing of population of the largest land mammal on the planet. On this Day all sorts of activities to draw global attention to the problem of declining populations of these majestic animals on our planet are held in different countries all over the world. 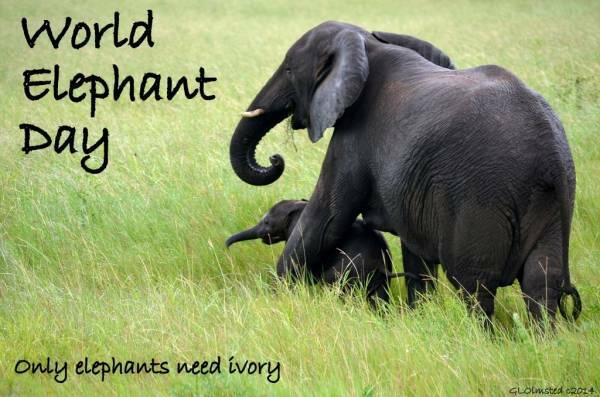 Today there are about 500,000 elephants in Africa; in Asia the population decreased to 30,000 (although it has been argued that these numbers are much too high), but under the current circumstances they may disappear in a few years. Both African and Asian elephants face extinction, with African elephants being “Vulnerable” and Asian elephants being “Endangered” on the IUCN Red List of threatened species. The main danger comes from poachers who kill elephants because of ivory. This affects older animals with large tusks. Death of female elephants causes severe conditions of their herd. As a result of this situation there is a large number of orphaned elephants who die before reaching 40 years of adulthood. The most extensive celebration of the Day is observed in Thailand.